"Romance." Watercolor by Kathi Baron. 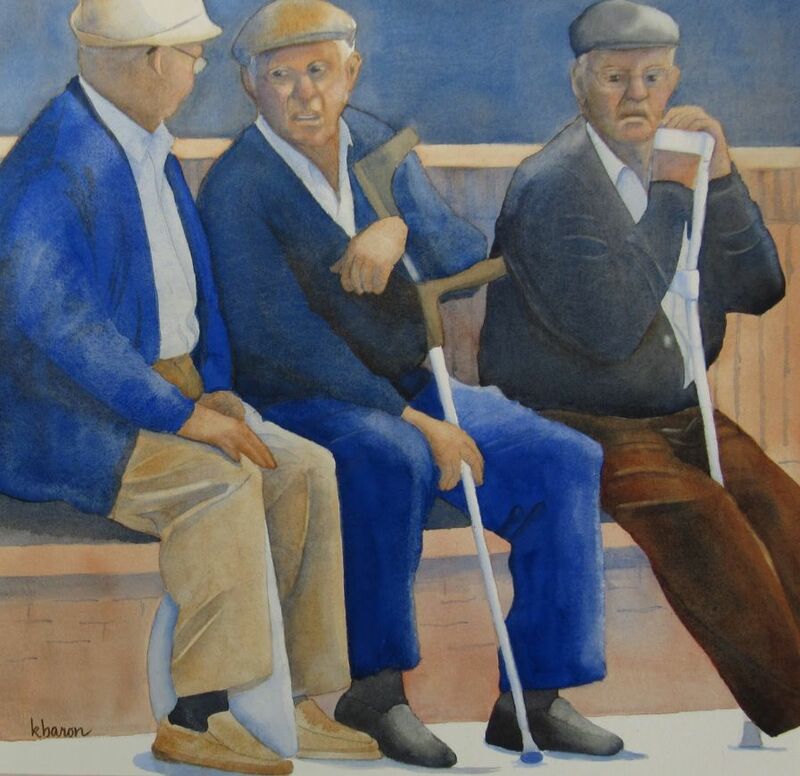 "Loafers," a watercolor by Kathi Baron, was part of the Art in Action exhibit "Honoring Our Elders." Local painter Kathi Baron has set out to dispel assumptions surrounding old age with her exhibit “Honoring Elders,” the newest iteration of the ongoing Open Doors: Art in Action series at the Episcopal Church of the Epiphany. In one detailed watercolor, an elderly Vietnamese man eats lunch on his work break. 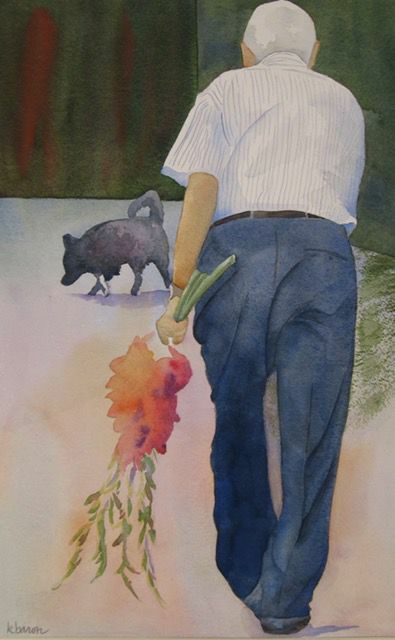 In another, a man carries flowers on his way to see a loved one. There’s a strong sense of each subject’s humanity in these paintings, something Baron said she is drawn to when she takes the reference photographs. Partnerships between Art in Action and nonprofits like Northland Hospice & Palliative Care, Senior Services and Meals on Wheels for Coconino County, Area Agency on Aging and Coconino Community Services promote the ways in which people can volunteer to nurture and support the elderly. This awareness and advocacy is one of the main ideas behind the Art in Action series according to committee chair Sue Norris. Heart to Heart: A Fundraiser for Northland Hospice Patient Assistance will be held Friday, Feb. 15, from 6-8 p.m. at the Episcopal Church of the Epiphany, 423 N. Beaver St. The evening will feature speakers from the participating nonprofits, as well as refreshments and live music. There will also be a special presentation by Shonto Begay on Friday, March 1, from 6-8 p.m. Open Doors: Art in Action’s “Honoring Elders” will be on display through March 18. Admission is free and regular exhibit hours are Tuesday-Friday from 9 a.m.-noon and 1-4 p.m., and Sunday from 8 a.m.-12:30 p.m.
Friday’s fundraiser will help Northland keep a variety of services available to people in need no matter their financial situation. From palliative care, spiritual counseling, support groups and more, the nonprofit assisted the people of Flagstaff for the past 36 years. While Baron, 73, found her purpose early in life as an English teacher and taught full-time for more than four decades before her current part-time status at Flagstaff High School, she knew it wasn’t something she could do forever. She began taking classes at Coconino Community College to learn how to paint when she was in her 50s, following in the footprints of her late mother. Baron’s paintings depict people around the world selling their wares or simply sitting and chatting with friends. Each painting is paired with a question that invites deeper inquiry into how to best honor and help the seniors in our lives. No matter the activity, Baron’s subjects seem to be involved in their community in one way or another. During their travels, she and her husband came across several “Blue Zones” described by New York Times bestselling author Dan Buettner in his books. These zones—Okinawa, Japan; Sardinia, Italy; Nicoya, Costa Rica; Ikaria, Greece; and Loma Linda, California—are considered to be the world’s happiest places where people live the longest. She sees a stark difference in the way the elderly population is treated in the United States as many adult children move away from their hometowns and aging parents are left on their own. For those who don’t have the resources or ability to take time off of work to care for aging family members, however, hospice centers offer a compassionate alternative where patients can continue to live the rest of their lives fully. “We give them activities to do, and it may be a small community, but we have that little community with our caregivers and volunteers in our houses where people can have a purpose,” Simmons said. She added the preconceived notion most people have of hospice as a subdued place where people just go to die is incorrect. It doesn’t have to be synonymous with the end of creating new memories. Testimony from a Northland Hospice volunteer described a patient who was admitted into one of their homes after he discovered he had late-stage cancer. He had lived a life of solitude in the woods and continued to prefer his own company while sitting in nature when he first arrived at the home. Baron’s art celebrates how life continues even as our bodies slow down. As long as there are family members and other participants within a strong community, there’s no reason someone should have to give up living a full life. Where: Episcopal Church of the Epiphany, 423 N. Beaver St.